On Aug 25th, Luke from Australia visited us. The main topics discussed were flexible circuit production process, testing and the improvement solutions. 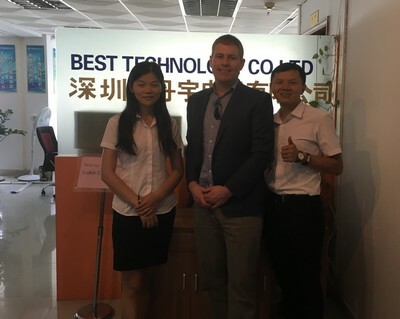 Firstly we introduced FPC production process to Luke, from raw material cutting, drilling, laminate, stiffener/adhesive tape, silkscreen, IC programming, testing, different outline making method (laser cutting for flexible circuit board prototype, Die-punching for flex board volume production). The most important things were opening & shorting testing for FPC and dimension and cosmetic looking using 2 D measurement machine. After seeing the E-Tester of his 4 layers flex circuit board, Luke known the board will be tested from both top and bottom side at the same time (We put and tested the flexible board top and bottom side on the E-tester, and the connector of FPC contact with the test pins on the E-Tester), and discussed how to avoid incorrect testing, such as missed or wrong testing point. The Tester was made according to customers’ original Gerber file. By using 2D measurement machine, we found out how break off trace, hole alignment and other issues affected the function of circuit board. After that, Luke told us his suggestions on how to make improvement for the production yield and testing and we will try these in future flexible board manufacturing. By this visiting, both Luke and us know much more of each other and believe there’re lot opportunities for flexible circuits in future.